FROM JASON’S SATURDAY MORNINGS OF YORE — Bugs Bunny never needed samurai skills, a robot sidekick, a secret base, superpowers, or a gun. Using just his wits and impeccable luck, he managed to fend off hungry hunters, vengeful rednecks, ravaging Tazmanian devils, and even the devil himself. Chuck Jones, the legendary Warner Brothers animation director who gave us the best Looney Tunes, never needed fancy computer-generated landscapes or extravagant cell-shaded character models, either. There’s something to be said for the simplicity and minimalism of Jones’ watercolor matte backgrounds and Escher-ish settings; very few modern cartoons with much larger budgets have achieved the same atmosphere. Rather than focusing on the style (though there was plenty — it was just understated), Jones and WB dallied instead on giving us relatable wise-guy heroes and surly-yet-sympathetic antagonists. 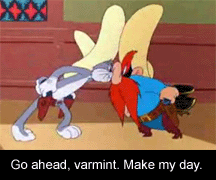 My favorite of the later by far was Yosemite Sam, who throughout his tenure as Bugs’ anvil-dropping nemesis went by a dozen different aliases as the setting dictated. Director Friz Freleng (his first name was Isadore, typically truncated in the credits to I. Freleng) said Sam was based on his own irritable and rash characteristics. The mustachioed villain was intended to be a leaner, meaner, more cunning version of Elmer Fudd, but he still never managed to hand Bugs Almighty his comeuppance. But at least you knew that whereas Fudd was… well… a fuddy duddy, easily fooled and manipulated, Sam was much less of a push-over. Bugs versus Fudd was always the San Francisco 49ers versus the Cleveland Browns. But Bugs versus Sam was the 49ers versus the Dallas Cowboys. That’s what made these three videos, my favorite Bugs and Sam match-ups, so much fun to watch. No matter how many times the 50-odd-year-old episodes ran, I always thought maybe — just maybe — Sam would get his day in the sun. While searching for the ever-elusive Miami Beach, Bugs instead finds himself in northern Africa. When he tries to take a swim in an oasis, he becomes embroiled in a property rights dispute with Sam. Let’s pony up to the truth here (or camel up to it). Censors, sensibility, and sensitivity would never let this piece air today. We’re too afraid of depictions of anything Arab (even though this is Africa) to let children watch this. All of these episodes have the same ploy-and-counter-ploy feel as the Road Runner cartoons, with Sam as the stand-in Wile E. Coyote. But while this has the quick-talking and self-assured Bugs to anchor it, Sam’s failure lacks the long-suffering resignation resignation we see every time Coyote plunges to the canyon floor. Don’t worry. Someday I’ll post about those shorts, too. The Roman Emporer Nero (Nero Claudius Caesar Germanicus, 37-68 A.D.) demands gladitorial entertainment and sends Sam to find a suitable victim. Guess who he finds. Jones and Freleng always had a way of making historical contexts interesting. Here, they have problems with dating — construction of the Colosseum didn’t even start until 72 A.D., and didn’t finish until 80 A.D.
Nero does fiddle at the end of the short as his lions turn on him (as the old legend goes, “Nero fiddled while Rome burned”), but as historians have often remarked, the instrument is entirely anachronistic. Fiddles weren’t even invented for another 1,000 years after his death. Maybe Nero harped while Rome burned — that would make far more sense. Especially obvious here is Jones’ attention to shadowing, which other cartoons simply didn’t do. It added an element of depth and integrity to the pictures. Pay special attention to the sun-lit walls in the prison cells. That’s where the absolute best bit happens: Bugs casually walks through a lions’ den, then as Sam tries to tip-toe through, Bugs lowers an alarm clock into the midst of the sleeping cats. Another anachronism? Sure. Hilarious? You better believe it, buddy. This short actually won an Academy Award in 1959 for Best Short Subject (Cartoon) and was even released on the big screen. Court Jester Bugs is sent to recover (the absent) Prince Valiant’s Singing Sword, the sister blade of King Arthur’s Excalibur. The sword was stolen by the Black Knight (Sam) and is guarded by the sneeze-a-rific Gerry the Dragon. When CBS used to air this one, it would censor the scene where Bugs smashes Sam on the head with a mallet. The resulting edit wouldn’t make any sense; we saw Sam cinch up a rope trying to storm the castle, then without explanation we saw he slide back down the rope in his boxers. It’s time for Bugs and Sam and the rest of the gang to return to television. Sure, the cartoons are nearly 60 years old, but they hold up remarkably well. While I’ve seen them hundreds of times, young viewers haven’t. I remember ABC would have the Bugs Bunny and Friends hour every Saturday morning. Nickolodeon used to air them every night, then Cartoon Network took up the cause. No longer. I miss them, and I would watch diligently. The least I’m asking for is a regular slot on TV Land.